The Birmingham region’s legacy is built on iron and steel. Founded on a culture of entrepreneurship and resiliency, Birmingham is home to a diverse and dynamic range of companies and communities. From multi-national corporations manufacturing next-generation vehicles to start-ups developing ground-breaking technologies, today’s Birmingham continues to boast a diverse community of innovators. Since 2011, the Birmingham region has announced over 19,400 new jobs and $3.9 billion in capital investment. Learn how these growing companies prosper by taking advantage of our region’s competitive business climate and unique assets. 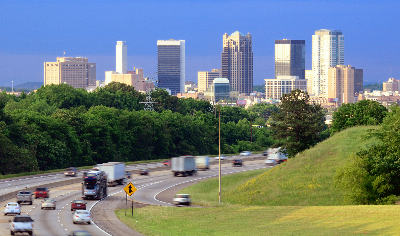 Centrally located in the U.S. Southeast, companies take advantage of Birmingham’s vast transportation network to improve their bottom line and access global markets. Five interstates (I-20, 22, 59, 65, and 459) provide access to over 250 million consumers, nearly 80 percent of the U.S., within a two-day drive. Port of Birmingham – 184-acre inland port with 100-ton crane, rivaling that of any inland port, connecting companies to the Port of Mobile via the Black Warrior River and offering unique, central access to CSX, Norfolk Southern and BNSF. The state’s largest airport, Birmingham-Shuttlesworth International Airport, offers 114 flights to 26 airports and 23 cities. Top-ranking programs at the world-class University of Alabama at Birmingham (UAB) and the surrounding 26 accredited universities and colleges within 100 miles (161 km) offer a strong talent pipeline of over 20,000 prospective employees annually. Looking beyond traditional educational programs? You’ve found the right place. Consistently recognized as one of the best state training programs in the U.S., Alabama’s workforce training agency, AIDT, has a successful track record of providing free, customized workforce solutions to eligible new and existing companies. 26 accredited universities and colleges graduating a pipeline of over 20,000 prospective employees annually. No. 2 state workforce development training agency in the nation according to Business Facilities. Designated TechHire community training 925 prospective, IT workers for the area’s tech talent pipeline. With competitive incentives packages and wages 94 percent of the national average, the Birmingham region offers a pro-business climate where companies thrive. Your hard-earned dollars will stretch further in Birmingham than any other metro in the country according to Forbes – leaving you with more money to enjoy our award-winning foods and recreational activities and give back to the causes you care most about. Don’t believe us? Come visit and learn why The Washington Post, The New York Times and others have named Birmingham a top travel and food destination.